A flight belonging to Abu Dhabi-based state-owned airline Etihad has made an emergency landing at Adelaide airport over a technical fault on the aircraft. The aircraft Boeing 777, carrying 349 passengers, left Abu Dhabi on Friday. The airline has said a technical fault with a cargo hold air recirculation fan had been found. Passengers were able to leave the jet through emergency exits, and continued their journey via other airlines. The Saturday incident is the Emirati carrier’s second in Australia this year. The Australian police arrested in July four men accused of plotting a terrorist attack against an Etihad flight out of Sydney. The attackers were to use poisonous gas or a crude bomb disguised as a meat mincer. 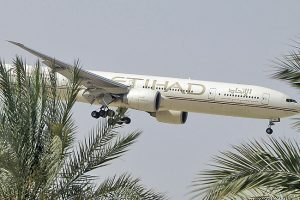 The would-be attackers reportedly linked to the Islamic State group were targeting Etihad flight bound for Abu Dhabi, with 500 passengers onboard. Posted by KanelkaTagba on Oct 14 2017. Filed under Gulf News, Headlines. You can follow any responses to this entry through the RSS 2.0. Both comments and pings are currently closed.